Shuffle a pack of cards. Look at the top card and place it face down on the table. Starting with one more than the value of the card (counting Ace as 1, Jack as 11, Queen as 12 and King as 13), count out cards on top of it until you reach 13. For example, if the top card is a 7, place it face down on the table and then deal 6 cards face down on top of it, counting "8, 9, 10, 11, 12, 13". Of course, if the first card is a king you won't need any extra cards. 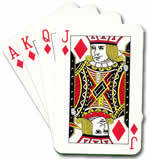 Look at the next card, place it face down on the table next to the first pile and do the same thing. Repeat until you have used all the cards in the pack and have a row of small piles of cards on the table. If you run out of cards before you complete the final pile, keep the cards from that pile to one side to start your magic counting pile. Now gather up all but three of the piles and add them to your magic counting pile. Choose one of the three remaining piles to be the secret pile. Look at the bottom cards of the two remaining piles and add their values. Count out that number of cards from your magic counting pile. Now count out 10 more cards from the magic counting pile. Finally, count how many cards are left in the magic counting pile, and look at the bottom card of the secret pile. Try again. If you like, you could use this trick to impress friends and relatives! Can you explain how this delightful trick works? Addition & subtraction. Generalising. Practical Activity. Working systematically. Interactivities. Curious. Counting. Creating and manipulating expressions and formulae. Mathematical reasoning & proof. Visualising.